i'm attempting to clean my office space. 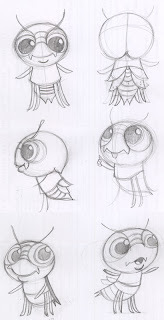 it's my last day in the office for the remainder of 2009, and i thought coming in to a (slightly more) clean office would be a great way to start 2010.
anywho, i found these sketches for waterbuggy critters. i like how my final bugs ended up, but i think these are kinda cute too. a bit powerpuff, but still kinda cute. who has the most fabulous 10 month old?